Let me say up front, if you’re interested in election tips or online voting system please visit those sections of the site. This article takes a diversion into the relationship between ElectionsOnline and America’s leading coldwater conservation organization, Trout Unlimited. At the time of this writing, the more than 1200 companies who share Yvon’s vision and joined 1% for the Planet, agree to donate 1% of gross receipts each year to the many organizations who as Yvon said, “do the good work.” One of those organizations is the Ernie Nester Chapter of Trout Unlimited based in my hometown of Charleston, West Virginia, but simply being based in my hometown is not what makes its relationship with ElectionsOnline special. The Chapter has stocked more than 1,300,000 fingerling brown trout into West Virginia’s coldwater streams. These trout eventually grow into catchable size fish and in many cases have begun naturally reproducing on their own making supplemental stocking of hatchery-raised fish unnecessary. As the name implies, roughly two dozen public schools throughout West Virginia are rearing trout right in the classroom exposing more than 7500 students to the life cycle of a trout until it reaches a size where it can be released into a nearby trout stream. Works similar to an Adopt-a-Highway program where volunteers take to the stream to clean up any trash. Limestone neutralizes high acid levels in streams impacted by either acid rain and/or highly acid runoff from abandoned coal mines. Treating the headwaters of such streams with pulverized limestone neutralizes that condition and creates a pH level suitable for the survival of trout. Please excuse the moment of self-indulgence, but I would be remiss if I didn’t also point out the Chapter won the Jean Bollinger award for best newsletter in the country in 1999. Remiss because I was the editor at the time. At the chapter level, I also received the Silver Trout Award that year, but would move to the Washington, DC area within a year to accept an unrelated job offer. Aside from the time I spent away at college, this move also meant I was no longer in a position to donate my time to the very worthy causes of this Chapter. But it would not be the end of me finding some way to make a contribution. In 2002 I founded ElectionsOnline, and in 2006 that company became a member of 1% for the Planet and began sending 1 percent of the company’s earnings back home to the Chapter. If I could no longer donate time, I would donate what I’m able and do as Yvon Chouinard said, and “give the money away to people who are willing to do the good work.” Because I used to be one of the people willing to do the good work, I could make these donations with the full confidence of knowing it would be used responsibly and put to good use on worthy causes. Then in 2013 the Chapter was renamed the Ernie Nester Chapter of Trout Unlimited in honor of one of its founding members who had just passed away from cancer at age 75. Ernie was a personal friend and fishing buddy of mine and I’ll always remember a day of fishing he and I had on a small stream in Fayette County, West Virginia for native brook trout. While not particularly memorable in and of itself (aside from the fender bender we got into on a windy country road heading to the stream), those fish would not have been there except for Ernie who was something of a Johnny Appleseed when it came to brook trout. He would catch them in one stream, and keep them alive long enough to transfer them to other streams to help get them established there. How? That’s where 5-gallon buckets come in. Together he and I fished the lower sections catching fish; placing them in 5-gallon buckets; then relocating them further upstream into water they would not otherwise have reached on their own due to waterfalls. With water weighing more than 8 pounds a gallon, you can see why this day of fishing was one I’ll never forget! Try a full day of climbing over rocks and logs with a fishing rod in one hand, and 40 pounds of water in the other, all while not spilling any fish! (Truth be told, the buckets weren’t completely full so the weight was probably closer to 30 pounds, but 40 makes for a better story.) The effort was well worth it though as the fish thrived so well the state legislature placed special fly-fishing-only restrictions on the stream within a couple of years with the intent to protect the fishery from overfishing and poaching. This type of effort was typical of Ernie who as the former chair of the civil engineering department at the West Virginia Institute of Technology, was a mentor to decades worth of young people. It’s also pretty typical of the hundreds of other devoted and hard-working members of the Trout Unlimited chapter that bears his name and there’s little question that the conservation, protection and restoration efforts of those members have made West Virginia’s coldwater fisheries the healthiest they’ve been in my lifetime and among the best in the eastern United States. There is something inherently eco-friendly about conducting an election on the web. It does eliminate or significantly reduce the amount of paper that’s historically been used to conduct an election (or for those who are fans of buzzwords created by marketing types, it does reduce one’s "carbon footprint") so it’s only natural that a business offering such a service would try to play up the “greenness” of its business. One goes so far as to claim their service is, “...the most eco-friendly system in the world.” I’m not sure what would make one company believe an election conducted with their service is any more “green” than anyone else’s, but realize when you see that ElectionsOnline is a 1% for the Planet member, it’s not just lip service in an attempt to score points by appearing socially responsible. It’s simply the current manifestation of a very genuine and decades-long commitment of environmental caretaking of its founder, yours truly, and one I consider myself very fortunate to be in a position to make. 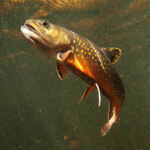 To learn more about Trout Unlimited and the work it does at the national level, visit www.tu.org. To learn more about 1% for the Planet, visit onepercentfortheplanet.org. Very well-written, educational story for one not knowledgeable about TU and its members. Thanks!